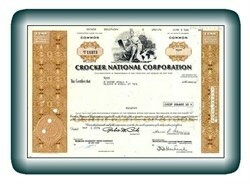 Beautifully engraved Certificate from the famous Crocker National Corporation issued in 1974 - 1976. This historic document was printed by the Jeffries Banknote Company and has an ornate block border with a vignette of an allegorical man sitting next to a globe. This item has the printed signatures of the company's officers and is over 25 years old.